FEMA (Federal Emergency Management Agency) – Providing various levels of financial assistance to property owners affected by storms. Walk-in consultations available at the Disaster Recovery Center, located at the former East Albany police center at 1721 E. Oglethorpe Blvd. Hours are 9 a.m. – 7 p.m. weekdays and 9 a.m. – 5 p.m. Saturdays. Assistance from GEMA (Georgia Emergency Management Agency) and SBA (U.S. Small Business Administration available at this location as well. American Red Cross– Providing assistance in the development of recovery plans through a multi-agency resource center, located at 2602 Dawson Rd. Hours are 9 a.m. – 7 p.m. Thursday Feb 2 – Friday Feb 3, and 9 a.m. – 5 p.m. on Saturday Feb 4. Georgia Baptist Disaster Relief– Offering free assistance to residential property owners who suffered storm damage. Sign up at First Baptist Albany, 145 Oakland Pkwy, Leesburg, GA. Call 470-389-3537 for more info. SafeAire– Dougherty County residents with central gas heating system who experienced damage can have a free system check to make sure their system is operating correctly. Call 229-883-5100 for more info. Harris 1 Trucking & Wrecker Service– Providing free towing to stuck or destroyed vehicles. Call 229-420-3711 for more info. Fast Copy & Blueprint– Providing fax, scanning and email services to those needing to relay documents and photos to insurance companies. Located at 1029 N. Westover Blvd. Call 229-434-0640 for more info. Aspire Behavioral Health & Developmental Disability Services– Open for counseling sessions with no appointment needed in light of storm-related emotional stress. Located at 601 W 11th Ave. Call 229-430-4140 for more info. Mormon Helping Hands– Offering removal of drywall, insulation, flooring, carpeting, furniture, trees and debris, instillation of tarps, and other assistance at no cost to storm victims. Register by calling 800-451-1954. Musculoskeletal Associates– Open to service non-emergent needs, walk-ins welcome. Located at 2311 Lake Park Dr, Albany, GA 31707. Call 229-435-0525 for more info. Albany-Dougherty Economic Development Commission & Albany Area Chamber of Commerce– Gauging business community needs through online survey, in order to assess damage and secure necessary resources. Take the survey here. Albany Area Chamber of Commerce– Offering a consumer protection guide to assist in contractor and service provider selections in the wake of storms. Guide is available here. Microbusiness Enterprise Center– Available meeting and office space. Located at 230 S Jackson Street. Call 229-420-4600 for more info. UGA Small Business Development Center– Conference room where businesses/individuals can utilize power and internet. Located at 125 Pine Avenue. Call 229-420-1144 for more info. CTSI– Small conference room, office space, IT services and disaster services. Located at 235 Cedric St. Leesburg, GA. Call Tammy McCrary at 229-446-9641. Albany Family Worship Center– Good Samaritan shelter holding up to 50, located at 3024 Kensington Court. Contact: 229-434-0342. First Baptist Putney– Good Samaritan shelter located at 1125 Antioch Rd. Contact: 229-436-5101. East Albany Church of God– Good Samaritan shelter holding 75-100, located at 216 Pine Bluff Rd., Albany. Contact: 706-566-3450. Raleigh White/New Seasons– Good Samaritan shelter holding 40-60, located at 2804 Philips Dr., Albany. Contact: 229-432-0222. Cutliff Grove Baptist Church– Good Samaritan shelter holding 75-100, located at 839 W. Broad Ave., Albany. Contact: 229-344-3199. Friendship Missionary Baptist Church– Good Samaritan shelter holding at least 150, located at 400 Pine Ave. Contact: 229-436-1284. Mt. Zion Baptist Church (MLK location)– Good Samaritan shelter located at 1905 Martin Luther Kind Blvd. Contact: 229-436-2418. Albany Transit System– Proving transportation to shelters. Call 229-446-2700 for more info. Islamic Center of Albany– Distributing food while supplies last at 2415 Sylvester road in the old Winn Dixie parking lot. Tide Loads of Hope-Washing clothes for free daily from 9 a.m. – 5 p.m. at the Civic Center located at 100 W Oglethorpe Blvd. Creekside Coin Laundry– Offering detergent, dryer sheets and washers and dryers for those displaced or without power. Located at 1584-A U.S. 19 S Leesburg, GA. Call 229-496-5853 for more info. Albany YMCA– Offering showers to those displaced by storm and without hot water. Located at 1701 Gillionville Road. Call 229-436-0531 for more info. Albany Community Acupuncture Clinic– Providing free acupuncture sessions to help relieve stress of those affected by storms. Clinic hours will be 9 a.m. – 5 p.m. on Saturday Feb 4, and 12 p.m. – 5 p.m. on Sunday Feb 5. Located in Parish Hall at St. Paul’s Episcopal Church, 212 N Jefferson St.
Westover Animal Hospital– Accepting animals. Located at 410 N Westover Blvd. Call 229-883-1618 for more info. Leesburg Animal Hospital– Accepting animals and parking lot wi-fi. Located at 246 Walnut Ave S, Leesburg, GA. Call 229-759-8384 for more info. Peanuts friends.org– Helping locate and return lost pets. See https://www.facebook.com/groups/PeanutsFriends/ for details. 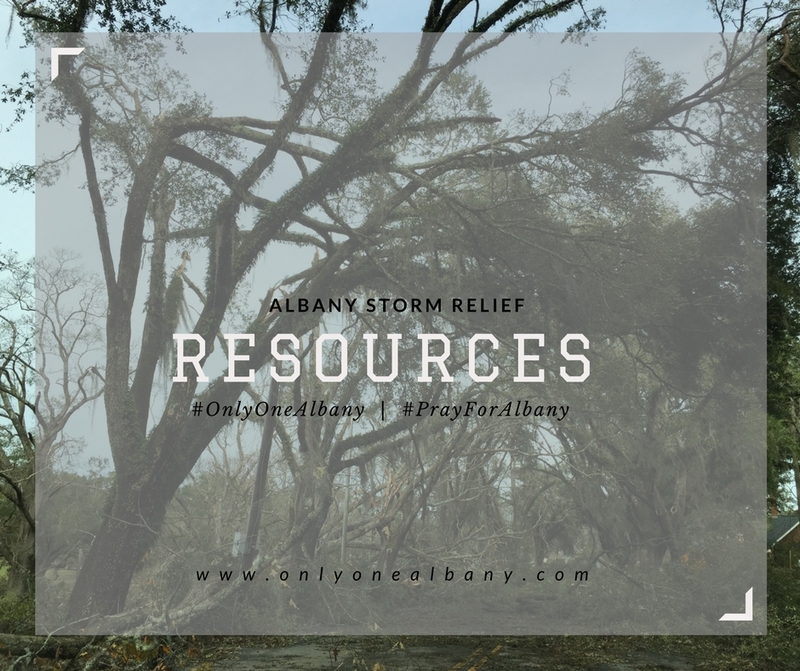 Sherwood Baptist Church– Accepting monetary donations for storm relief efforts. Mail a check to Sherwood baptist Church 2201 Whispering Pines Rd. Albany, GA 31707 with the memo:”#HelpAlbany”, or donate online at www.sherwoodbaptist.net/give and select “Help Albany” in the drop down menu. UnitedWay of Southwest Georgia– Accepting monetary donations benefitting nonprofit organizations aiding in storm relief in county of donor’s choosing: Baker, Calhoun, Dougherty, Mitchell, Worth, or county in greatest need. Donate at www.unitedwayswga.org/help. Dougherty County School System– Accepting monetary donations in the form of either cash or checks which can be delivered to DCSS Administration building at 200 Pine Avenue, or mailed to DCSS Disaster Recovery Fund at P.O. Box 3170, Albany, Ga. 31706. Item donations such as clothing, hygiene products and non-perishable food can be dropped off at DCSS’ facility located at 722 Corn Avenue. Contact: 229-431-1264. American Red Cross– Accepting monetary donations to support the cost of providing for disaster victims. Donate through AT&T by texting TORNADO to 90999 to make a $10 donation. Mission Change– Accepting monetary donations to assist with costs associated with providing for storm victims. Donate by texting GIVE to 229-469-8069 or online at paypal.me/missionchange. Dougherty County Rotary Club– Accepting monetary donations in order to provide financial assistance to storm victims through a grant application process. Contact judyrandle@msn.com for more info. Friendship Missionary Baptist Church– Accepting monetary and item donations to meet the needs of those affected by storms. Donate at https://www.gofundme.com/storm-relief-fund. First Baptist Church Albany– Accepting monetary donations for storm relief needs and supplies. Located at 145 Oakland Parkway Leesburg, GA. Contact: 229-883-8000. First Baptist Putney– Accepting item donations of water, gatorade and non-perishable food items for shelter guests. Located at 1125 Antioch Rd. Contact: 229-436-5101. Raleigh White/New Seasons Church– Accepting breakfast, lunch and dinner foods to serve to shelter guests; servers needed. Located at 2804 Philips Dr. Contact: 229-432-0222. Coca-Cola bottling plant– Accepting bulk, palleted items at 925 Pine Ave. Contact: 229-883-1910. Woodall’s convenience stores, GooGoo Car Wash & the Hearts & Hugs Foundation– Accepting monetary donations to be distributed to organizations assisting with storm recovery. Donate here.